Ever wonder about the story behind some of your favorite book bloggers’ websites? Well, wonder no more because each month we’re featuring an interview with a well-known blogger. 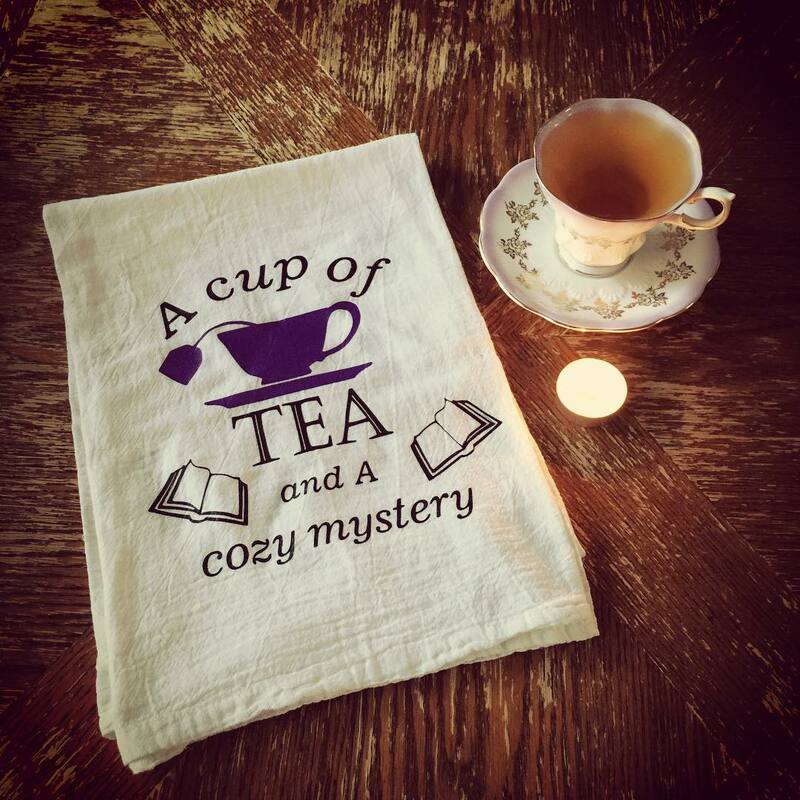 Our November guest is the amazing Karen M. Owen from A Cup of Tea and a Cozy Mystery. Hi cozy fans, the Chicks are thrilled to have blogger/reviewer Karen Owen visiting with us today! Take it away, Karen! Please tell us about your blog. Why did you decide to write it? What are some of the challenges and/or successes you’ve experienced along the way? I started my blog A Cup of Tea and A Cozy Mystery after finding success as a doll and craft blogger, I would spend my earnings from my work online for cozy mysteries. At the urging of my friend Lisa Kelley from Lisa K’s book reviews, I started my cozy mystery and tea blog. In 2010 my mother died rather suddenly, and I felt quite lost. Shortly thereafter, I was taking my boys to the library, I spun a rack of books near the kids section, and took home any book that fell as I spun it. It was there that I discovered a love of cozy mystery books! I began photographing my morning tea (I call them “Me Moments”) as a way to hold myself accountable for taking some time to look after myself. The grief process is a long and strange one, but through it, the constant companionship of great books and tea helped me with an escape and support that I craved. The challenges I have had along the way are really not that big. I was publishing daily for the longest time, holding myself to an imaginary deadline. Recently I have started working outside the home and spending time with friends more, so I have not been devouring cozies as fast as I did 6 months ago, for me it is a challenge and a blessing to find that balance. Do you also post your reviews elsewhere (Goodreads, Amazon, Barnes and Noble, etc.)? Why or why not? I review on my blog, post photos of what I am reading on instagram, twitter (when I remember), NetGally, Amazon.com, and Amazon.ca. I also share my review links on my Facebook fan page. I am Canadian and I live in Canada so oddly enough, I have to post two reviews, sometimes my Amazon reviews are accepted and sometimes not. I also tell anyone who is listening about what I am reading. What are some of the best or most surprising experiences you’ve had related to your blog? I have been very lucky, through hard work and through connections I have made, my blogs have all experienced quite a bit of exposure. I was voted one of the top bloggers in Vancouver a few years ago, and I have also been given accolades from Feedspot.com. Mostly though it is the daily feedback on my photos and comments I receive through email and social media that mean the most to me. When an author likes or sees I am reading their book, or a reader takes time to comment on what I am reading, I feel very blessed. What advice would you give to new bloggers and/or to authors who would like to connect with book bloggers? To write for yourself. To write how you feel and to keep at it. In writing my blogs I feel that they are more about and for me than anyone else. If you write something people can connect to, they will find you, there is a bond created and shared. Join groups on Facebook where you can share links to your work and enjoy the process. If it begins to feel like work then revisit why you are doing it. No one makes money at it, so you really need to think about why you are doing it. If it doesn’t feel right or make you happy, perhaps you need to rethink. As well as being a cozy mystery fan, you’re also a tea aficionado and tea cup collector. We enjoy the vignettes you include with your reviews of the reviewed book with a cup of tea and a candle. How do you select just the right teacup for each book, and what is the perfect tea to drink while reading a cozy mystery? Thank you! The “vignette” started off as something for me, something to remind myself that I am worth it, that taking time for me is important. And it’s a way of documenting my own journey through the craziness of day to day life. I have collected china, starting with Old Country Roses since I was 13. In recent years I began rescuing teacups and saucers, and by rescuing I don’t just mean collecting. I drink out of every cup and saucer I bring into my house. My son who is almost 11 recently asked how many I had and I told him, “We don’t ask that, it is like asking a lady how old she is…” However, that got me curious so I actually started to count them, when I got to 150 and saw I had way more to count still, I stopped. Knowing exactly how many is too much info for me to handle! How I pick them for the morning is often just walking around my shelves and picking the one that speaks to me that morning. Sometimes I see the cover of a book I am reading and know which one I need right away, sometimes I try two or three before the photo is taken. Some days I use up to 10 sets just to enjoy. While I love my teacups, they are all in used condition. I believe in using them for their purpose and that I am worth using them on, that the guests who come to my door or the people who live with me are more important than the cups and saucers themselves. So, anyone aged 0-100+ is welcome to use and enjoy the cups placed in my care. We do break and crack them through use, but I never truly mind. I take comfort in using them for their intended purpose and enjoy the process of finding and replacing them at the thrift stores or local charity shops. My favorite teas to sip while reading are actually Murchie’s Tea blends. After being a customer for years, I am now working for Murchie’s. Their Vanilla black tea is my standby, although I love the smoky, vanilla flavor of the London Afternoon tea—especially on those perfect rainy afternoons where you curl up on the couch with a blanket and a cozy mystery! Read more about Karen below and say hi or share your thoughts on tea and such in the comments. 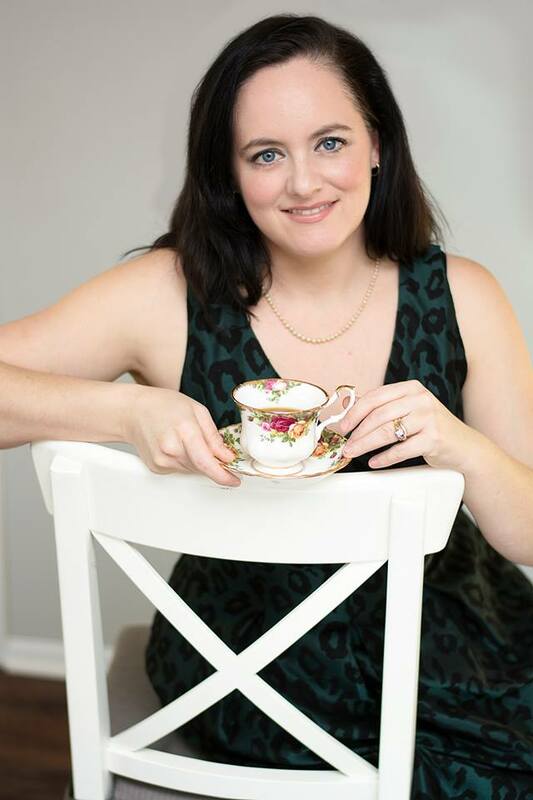 Karen M. Owen is a tea aficionado and cozy mystery lover, as well as being a busy wife and mom of three boys. She lives on the west coast of Canada in Vancouver BC, where she enjoys reading and reviewing, and baking and crafting all things related to the enjoyment of tea and cozy mysteries. In 2017, Karen was named a Top 10 Cozy Mystery Blogger by A Cozy Experience. Catch up with Karen on her blog and on Facebook. Tags: blogger, cozy mystery, tea aficionado. Bookmark the permalink. Karen, I’m OOT and it’s hard for me to comment, but I had to find a way because I love your blog! What a great interview. I’m so sorry about your mom. I happen to be a tea lover too. I’ve never heard of Murchies but now I have to look them up. How amazing you get to work for them! What do you do? I am so happy to have you here! I work in one of the retail stores and I love it so much! Just getting up here on the West Coast! Murchie’s Christmas Blend Tea in my cup this morning. Thank you for being here. Welcome, Karen! I love everything you do for the cozy mystery community, and you’ve been kind enough to host me on your blog in the past. Thank you for being such an avid supporter! That is so lovely to hear! Thank you so much and I am thrilled to do so! I loved learning a little more about you and why you started your blog. I am so sorry about the loss of your mother… it’s never an easy thing to recover from. I look forward to every photo you post of both your teacups and the books you read! I’ll have to admit though, that I’m slightly jealous of your well-loved teacup collection 🙂 You’ve inspired me to visit estate sales and keep my eyes open for “rescue” cups. Hi Kim! Thank you! Each cup is worth rescuing, using and sharing! I read your blog daily! Thank you! Love having you join me for tea! Hi Karen: Thanks so much for visiting us today and for all of your blogging! Love your tea cup and book pairings. They’re soothing works of art! Happy that you found cozy mysteries (though I’m very, very sorry about your mom). Vancouver is gorgeous–what a wonderful place to live. Are you going to Left Coast Crime? Hi Cynthia! Thank you so much! I am so thrilled you love the photos as much as I do! I love my cozies and thank my library for that! Thank you for your kind words about my mom, I know she would be very proud of me. I don’t have tickets yet for Left Coast Crime but I am hopefully going to meet up with all the lovely people who make it here. NaNoWriMo is going great! Thank you for asking! Karen, glad NaNo is going well — you go, girl! I’m tanking at NaNo at the moment, but hope to make up some ground next week! Karen, so glad to have you hanging out on Chicks today! I LOVE your tea cup and book vignettes, and as you know I’ve shared a couple of those photos featuring my books (with your kind permission)! And thank you for reminding us we are all worthy of some self-care — and deserve to use the good china! Such a treat to be here! Thank you so much and I love it when Authors get excited about my photos, please share! So nice to hear a little more about your blog and how the tea part of it came to be. I certainly agree that it is the comments from others who help keep me going as well. Hi Mark, it is amazing how much the encouragement of others really helps us keep going! Aloha Karen, from Hawai’i, where I’m just getting up! Thanks so much for joining the Chicks today, and thank you for all you do as a fabulous blogger! A good friend and I used to have what we called “mad tea parties,” where we’d mix and match beautiful old china pieces so each set was a mixture of different sets. And we’d have a variety of teas in different pots–and lots of cucumber sandwiches and scones, as well, of course! So glad that your morning tea has been such a solace for you. Leslie! Mahalo! I love the mad tea party idea! I could totally go for the sandwiches and I just made and ate cheese scones! What a delightful post. So glad I discovered the Chicks and your post. I love tea and cozies so I will be hopping over to your blog to find out more. Murchies is new to me too. I would love to have a few of your teacups so when my granddaughter and I host her mom and aunt for tea, we’d have some very special “flavor” on the table. You’ve inspired me to visit some resale shops and pick some up for our next tea together. Thank you. J.Q. Rose, I am so thrilled to hear this! Rescue, Read and Repeat! I hope you find exactly what you are looking for! Hi JQ, I’m a middle “Q” also! What does yours stand for? (Mine is for Quinn. My mom and dad were both “JQs” (Jeanne and Jack). You don’t have to actually say, if you’d prefer not to–just wanted you to know–and welcome to Chicks! Karen, it’s so nice to learn a little bit more about you here. I’m so sorry about your mom. Your photos always make me stop and breathe – they’re beautiful, yes, but also put me in such a relaxed frame of mind, just like teatime. I am a huge tea lover and will now have to go check out Murchie’s! Thank you for the moment of peace in every busy day. Shari, I am so very touched! Thank you! I am thrilled you enjoy the photos and thank you for your kind words about my mom. Oh Lisa, lovely to hear from you. The London Afternoon is a smoky Earl Grey! I would love to try Alice’s Tea Cup! email me at karenmowen@gmail.com and maybe I can swap you some tea!